Your time is valuable and this is an investment in money, time and heavy lifting. We identify the real issues – fast. Every business is different and so are the issues yours may be facing. Some to consider: financial, operational, cultural, even customer experience. We’ll help you find out. Straight questions, straight answers, understandable language. Consultant-speak isn’t spoken here. We’re a practical business owner just like you. We know how to get the results you’re looking for. We start the dialogue you need to have. 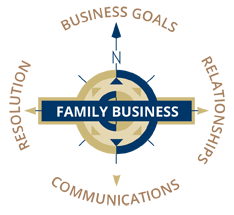 Growth and transition in a family business involves conversations that aren’t always easy, but they are necessary. We can start and manage this essential process so everyone is thinking and seeing clearly. Family, future, financial security. Compass Point is dedicated to helping families build financially strong businesses that can be successfully transitioned to a new generation of owners. The result? You, your family and your employees all continue to be financially secure.